The Pennine Way excited me from the moment I opened my new book. It introduced the novel concept of a long-distance footpath along what we used to call ‘The Pennine Chain’. There were weird place names like Kinder Scout and Cauldron Snout, photographs of young hikers crossing peaty moors, and anecdotes from journeys attempted in fair weather and foul. Neil, John Thornton and I felt we’d proved ourselves strong and committed enough in the Lakes, and we knew we could hike thirty miles a day in Wharfedale. If we combined such qualities and achievements, we could complete the walk in thirteen days. What a challenge it would be! What an opportunity! We held what might be described somewhat pretentiously as a Planning Meeting, at which my copy of ‘The Pennine Way’ by Kenneth Oldham provided the only hard information. Neil grabbed the jobs of acquiring the Ramblers’ Association booklet on the route and the booking of beds and meals at the youth hostels. John and I tacitly accepted that was Neil’s natural role. Thereafter, filled more with optimism than with realism, we sat back as world events unfolded: the Profumo scandal shocked Britain; Cooper floored Clay; JFK mispronounced ‘Ich bin ein Berliner’; Viscount Stangate became Tony Benn; the Great Train Robbers pinched £2.6 million. We, untouched by such trivia, waited for our departure date, the twenty-fourth of August, nineteen-sixty-three. Neil detailed his mother, who worked for the county library service, to obtain Ordnance Survey maps on extended loan. Dad was coerced into transporting us south along the A61 in the Dormobile. 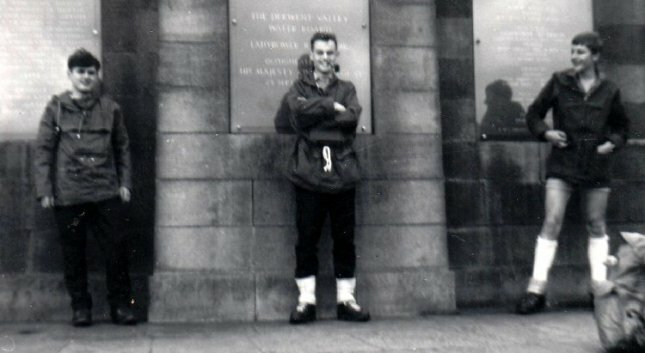 We trundled through the centres of Leeds, Wakefield, Barnsley and Sheffield – there was no M1 motorway in those days - and he dropped us at Ladybower Reservoir, taking our photographs before we set off on a warm-up over the hill to Edale. If he or Mum were concerned they never mentioned it to me. Mum restricted herself to saying ‘Conduct yourself properly’, which was her standard admonition whenever I left the house. I suppose she felt I’d be safe with Neil and John. So did I, until Neil announced at Edale Youth Hostel that his mother had been unable to procure all the maps, a notable omission being the sheet which covered Cross Fell, the highest point on the Pennine Way. We adopted a lone walker at Edale Youth Hostel and set out to hike some thirty miles across Kinder Scout, Bleaklow and Black Hill to Holmfirth Youth Hostel. An hour into the walk we were floundering in the mist-shrouded groughs of the Kinder plateau, and our day was doomed to significant modification. We lost our way, wasted time and expended precious energy before getting back on track, and then the weather turned wet and dark. We reached Longdendale late in the afternoon and decided we shouldn’t attempt Black Hill, so we split into pairs and thumbed lifts to the Youth Hostel. Chastened but not downhearted, we’d learned lessons that helped us to cross the rest of the South Pennine moors, and that came as a relief to me, because I’d sensed that one or two of my mates thought I might not make it through. As the youngest, I was desperate to prove I deserved my place on the hike, and so I competed with Neil and John, and against the trail, pushing myself through the pain of a heel injury that disappeared after the first three days. On our fourth day we struggled into Malham, but next morning we felt on top of our game, charging over Fountains Fell and Pen-y-ghent under the hot sun to finish at Dentdale Youth Hostel. Heavy rain set in overnight, so we took a lunch break in a café at Hawes. Each of us had two fish and chip dinners, and we drank a total of thirty-three cups of tea over a three-hour period, at a cost of thirty shillings (£1.50). At Keld Youth Hostel that evening the Warden served up fish and chips for dinner, and we ate our packed lunches in bed. By that time we’d experienced every kind of weather the English summer can produce, and we were going well. Teesdale was a revelation, and High Cup took our breath away, as it does for almost every visitor. Cross Fell gave us no trouble, and only our own logistical shortcomings forced us to cut short a day of wonderful weather on the traverse of the Cheviots from Byrness to Kirk Yetholm. I brought home inside me the thrill of gazing at far horizons of moors and mosses, green dales and high brown watersheds, grey crags and dark, dank forests. I’d relished the knowledge that each day’s journey would go beyond the next skyline and had felt inspired by the sense of walking away to somewhere new, rather than making a round trip from home. Something told me I’d be back.